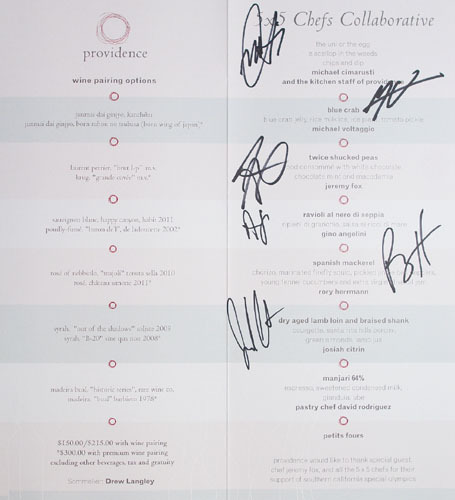 In a particular dinner, each of the five "core" chefs and one guest chef prepare one dish in a multi-course meal, with dessert coming from the host restaurant as well. This year's fab five are: Gino Angelini of Angelini Osteria, Michael Cimarusti of Providence, Josiah Citrin Mélisse, Rory Herrmann of Bouchon, and Michael Voltaggio of Ink. It's interesting to note that only Cimarusti and Citrin remain from the original 2007 line-up. Here we see the night's menu, priced at $150 per head, plus $75 for wine pairings ($150 for premium wine pairings) from Sommelier Drew Langley. 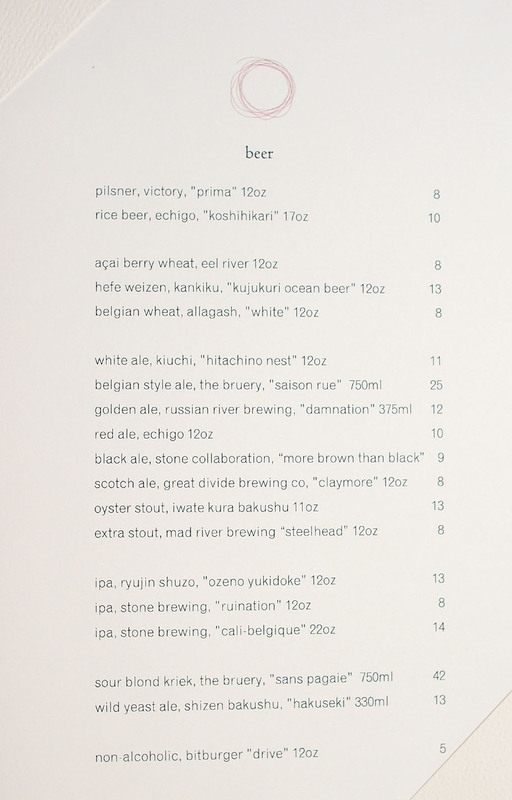 We also opted for some beers from Providence's newly expanded list as well. Click for larger versions. 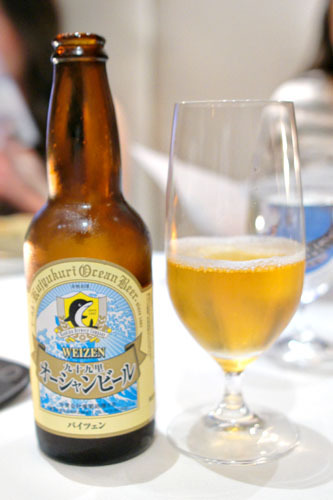 Speaking of those beers, the first was the Kujukuri Ocean Beer Weizen [$13] from Kankiku Brewery in Chiba, Japan. Though it was labeled a weizen, it wasn't quite like any hefeweizen that I'd had before. There was definitely some wheat character, but also a strong, funky, citrus-y component in there as well, joined by a marked maltiness and a tinge of spice. 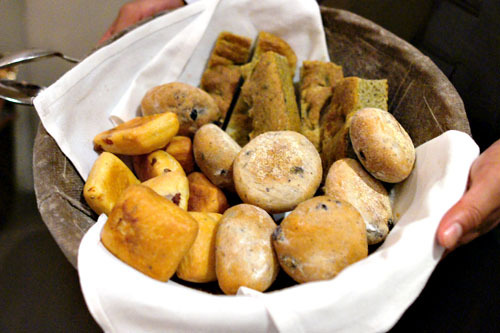 Breads on offer tonight included seaweed, black olive, and bacon varieties, and came accompanied by salt and Providence's signature circular pats of butter. The meal got off to a promising start with a troika of whimsical amuses. Uni custard arrived married with almond milk, and we sucked out the sweet, saline liquid from a perfectly punched hole in a hollowed out egg shell. 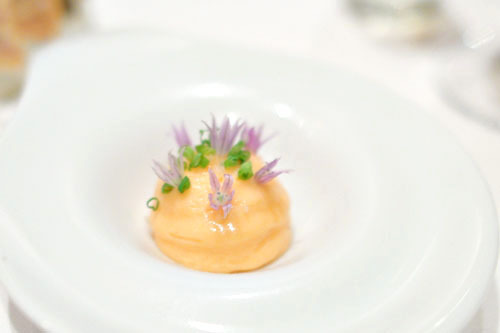 A "taco" presented us with a tartar of ponzu-cured scallop and sushi rice, all enveloped in nasturtium, its tangy, peppery relish playing off the sugary brine of the scallops in complex, stellar fashion. They saved the best for last, though. 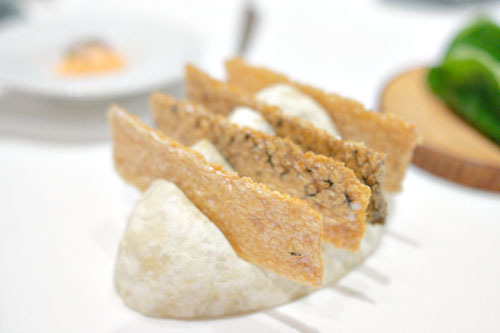 Salmon skin crisps were fantastic, with an intense, umami-laden smack and delightfully crunchy consistency that was delicious either with or without the rich, luscious demisphere of cured trout mousseline. 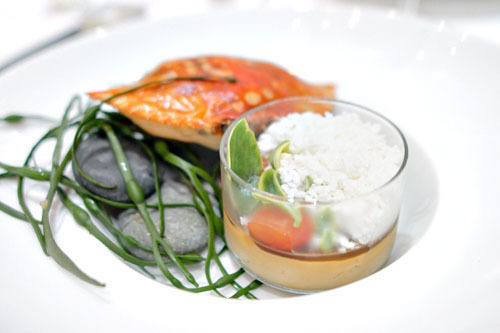 A custard of blue crab showed off the in-your-face sweetness and brine of the crustacean, balanced against the tart, tangy flavors of the tomato, while the ice plant added crunchy hints of piquancy to the mix. 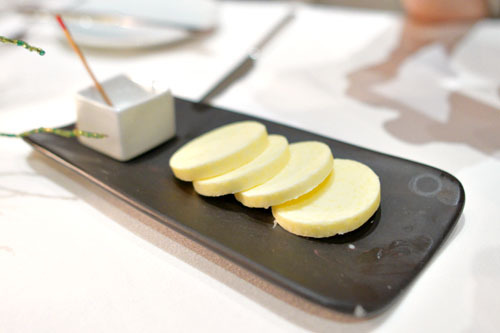 The rice milk provided a further temper to the dish, and also offered a bracing temperature contrast. 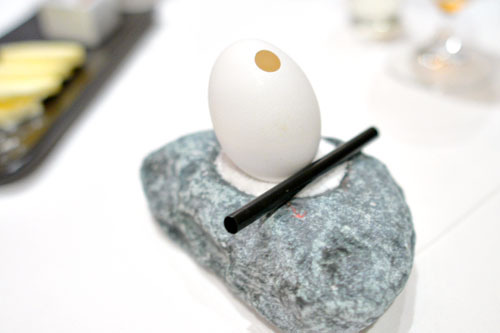 A pure, playful, heady celebration of crab meat, deftly paired with the crisp, subtly saccharine junmai daiginjo sake. laurent perrier, "brut l-p" m.v. 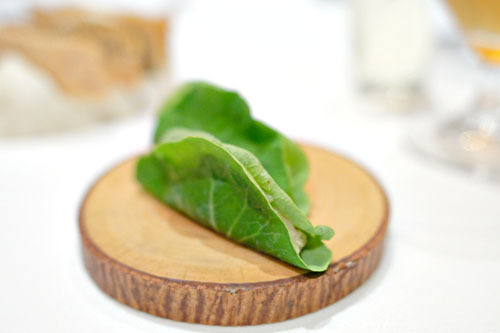 Here, Guest Chef Jeremy Fox presented a reworking of a dish that he served two years ago at Animal, and it was easily the most cerebral course of the night. 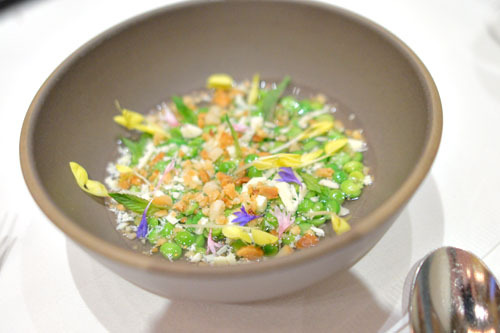 Peas were laboriously double-shucked, making for a great textural component and really exemplifying the pure, unmitigated essence of the vegetable. The crux, though, was the use of chocolate, which added sugary and minty overtones to the dish, their creeping, delicate sapors intermingling with the peas in contemplative manner. The flavor combinations were a bit unconventional, but they worked. 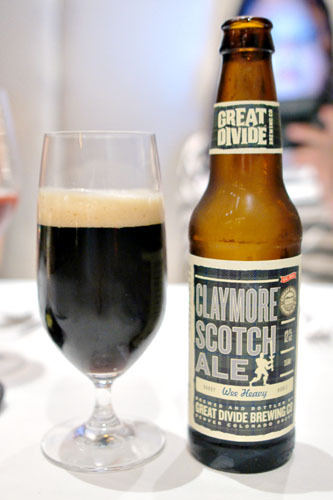 Our next beer was the Claymore Scotch Ale [$8] from Denver's Great Divide Brewing Company. This one was pretty intense, with a good amount of caramel, smoke, coffee, and roasted malt flavors all intermingling on the palate. At the same time however, it was still fairly dry, and not overwhelming in its potency. 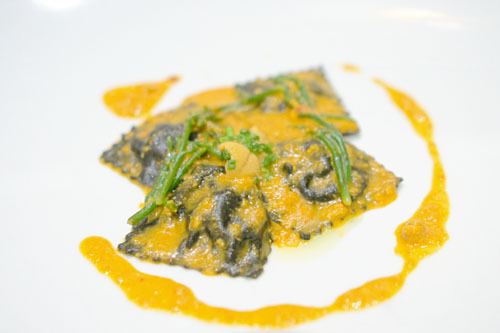 Squid ink ravioli arrived stuffed with crab and dressed in a sea urchin sauce. The pasta was pretty much spot on, pleasant in bite, with a superb interplay between the two facets of sweetness from the crab and the uni. They complemented each other commendably, while the sea beans added pinpoints of saltiness to the fray. I especially appreciated the pairing of the Sauv Blanc here, which sort of served to intensify the flavors on the plate. Herrmann's mackerel arrived with cuts from both the head and the tail, joined in the middle by a line of chorizo, forming perhaps a scombroid analogue to Morbier. The fish was on point: savory and lusty, with a lovely trace of heat from the sausage. 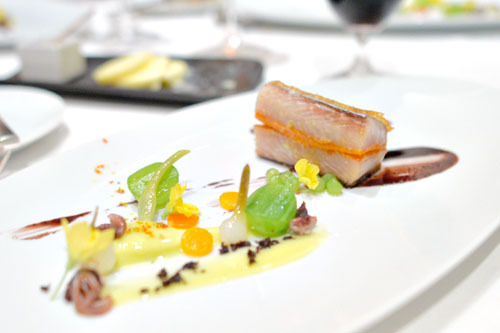 The use of squid augmented the inherent brine of the mackerel even further, while the jam and various veggies at play contributed lightness and balance to the dish. 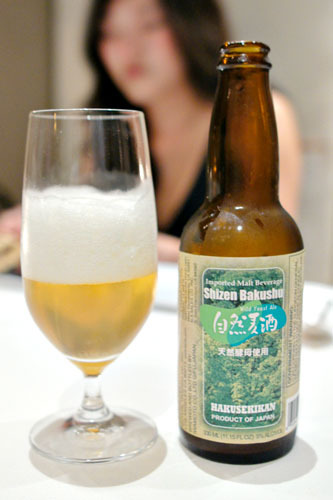 The last beer of the evening was the Hakusekikan Shizen Bakushu [$13] wild yeast ale. Not surprisingly, this one was funky, tart, woody and sour, with a good acidic backbone and just a bit of hoppiness toward the end. 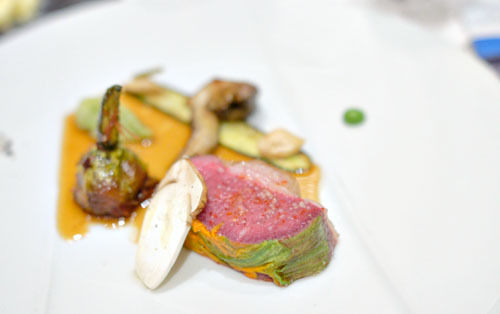 A loin of dry-aged lamb came to the table rare, perhaps too rare for some, and was teeming with ovine goodness, interspersed with pricks of saltiness, while zucchini and green almond formed fitting counterpoints to the meat. The shank, meanwhile, arrived stuffed in a squash blossom, and was just as you'd expect from the braised preparation: rich, tender, and luxurious, a deep, dark umami-bomb almost futilely moderated by the greenery on the plate. 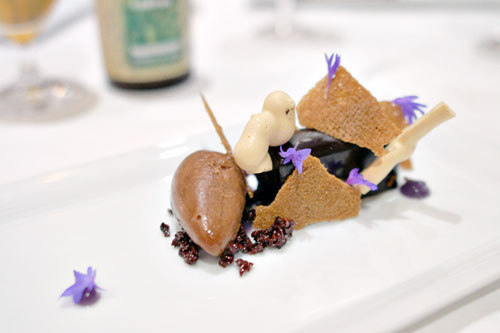 madeira bual, "historic series", rare wine co.
Valrhona's Manjari from Madagascar was the star of the show in our dessert. Incredibly dark, dense, and decadent, its subtly fruity, bittersweet essence went swimmingly along with the intense espresso flavors present. Lovely textures here to boot--like chocolate covered coffee beans. 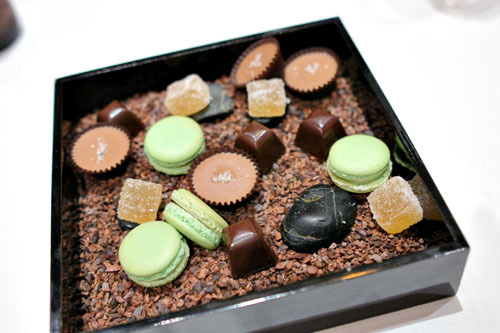 A tray of mignardises brought us cascade hop pâtes de fruits, peanut butter cups, chocolate truffles, and kaffir lime macarons (watch out for the rocks though). 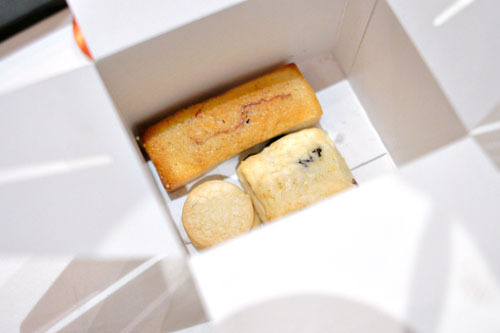 A separate box of breakfast pastries, meanwhile, contained cherry scones, blackberry financiers, and lavender shortbread cookies. After a prolonged break, it was great to be able to see the 5 x 5 Chefs Collaborative back in action again. 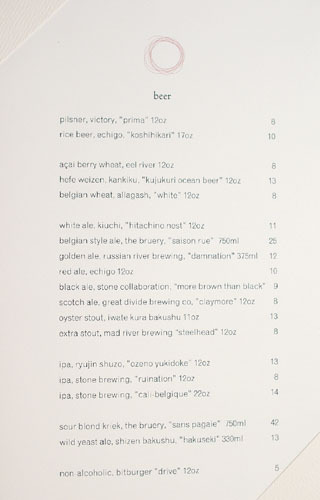 The dinner was certainly as memorable as I recall the 5x5's being, and once again, it was interesting to see the incongruities between each Chef's style and how they worked past that to create a cohesive meal. 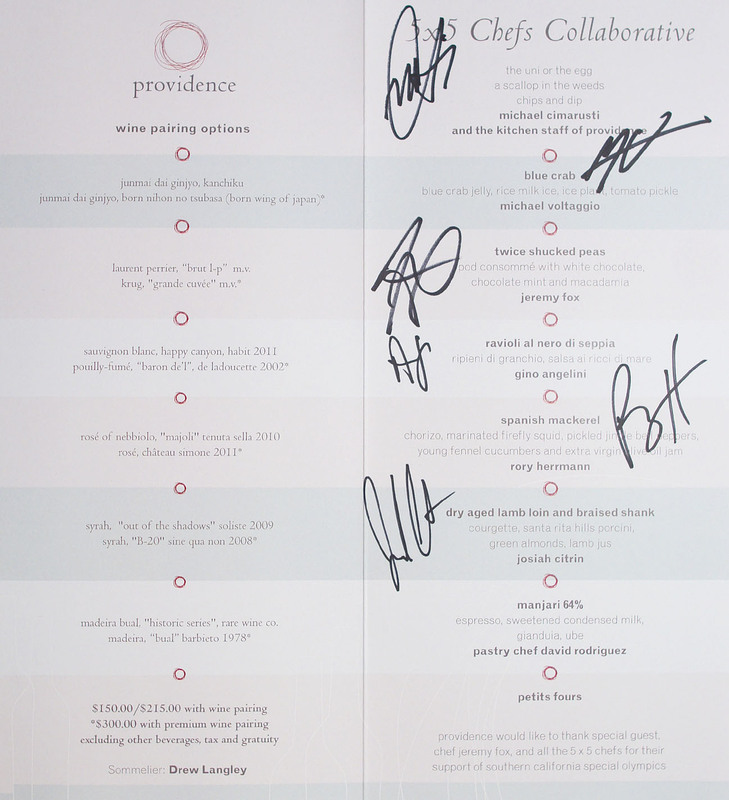 Though the line-up has changed considerably throughout the years, the group's original goal of bringing chefs together while helping out a cause remains as strong as ever, and I do hope that they can continue the series in the future--so no more three year hiatuses please. Anon: It's easy; just call the restaurant. The ink. one may sell out quick, so act soon! CJ: Thanks! Keep in mind though that I don't do much with Foodbuzz these days. Likewise. Good to see that you got your post up!